For drummers today, electronic drum sets offer a range of distinct advantages over acoustic drum kits. First up there’s the volume. Electronic drum sets allow drummers to practice for hours on end without waking up the neighbors. Then there’s the sound selection. Even a beginner standard electronic drum set will ship with a multitude of different drum and cymbal sounds to cater to all styles of music. 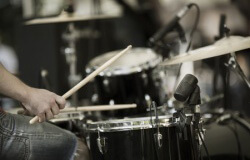 You can also plug most electronic drum sets into a computer to use for recording in the studio. This eliminates hours and hours of acoustic miking, mixing and mastering that goes hand in hand with regular drum kits. On top of all that there are the convenient practice options and built in features such as metronomes and song templates to groove over. With all of the options and convenience that electronic drum sets have to offer, its hard to go wrong with going the electronic route. Electric drums have been with us for years. They have a long and checkered past, from the early basic analogue iterations to the sophisticated digital offerings of today. But who makes the best electronic drums nowadays and which electronic drum set should you buy? 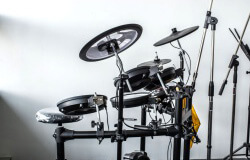 In this article we will discuss some of the top rated electronic drum sets on the market today and list their pros and cons. The article is split into four main sections, which are graded on price ranges, from beginner to high budget professional level. 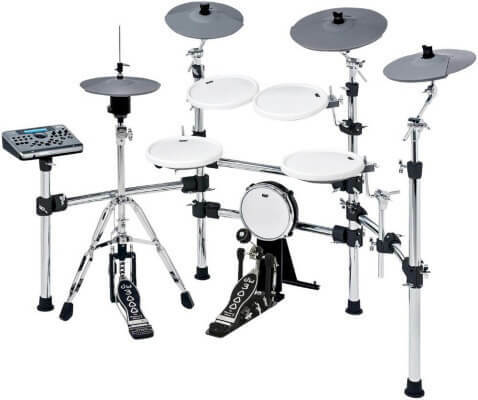 With beginner and lower end electronic drum kits, you’ll often find that they come with additional items such as drumsticks and drum stools. As the price increases it’s common to see these items left out. There are several reasons for this. One is that by not offering these extras, the drum companies are able to keep the price down to a minimum and that is always music to the consumer’s ears. The other reason is that most purchasers of mid to high end electronic drum kits tend to already have some experience playing, have the necessary tools such as sticks and have their favorites in this regard. This could refer to a drum stool that you can’t play without or a bass drum pedal that suits your technique like no other. Beginner electronic drum kits are largely aimed at youngsters and tend to be quite lightweight. 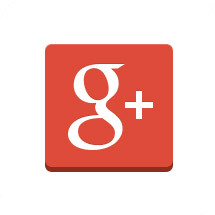 You won’t find any fancy features and most are not designed to last several decades. They can still be quality made but are not always made to last as long as their more expensive counterparts. These kits are made for the entry level crowd and kids that want to get into drumming but want a less expensive and noise level friendly alternative to the acoustic drum sets. With that in mind let’s take a look at some of the best beginner electronic drum sets on the market today in 2018. A great offering from Roland electronic drums specifically catering for beginners to the instrument. 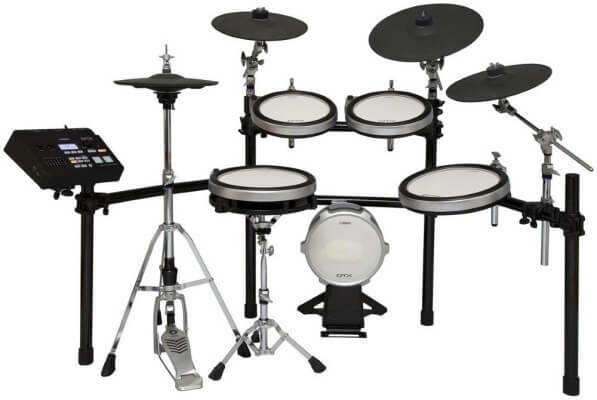 This kit comes with 4 drum pads and 3 cymbal pads and is a good electronic drum kit to learn on. It’s extendable, meaning you can buy more parts, such as drum pads, and increase your kit size. The overall feel of this kit is good and it’s quite sturdy yet not too heavy. 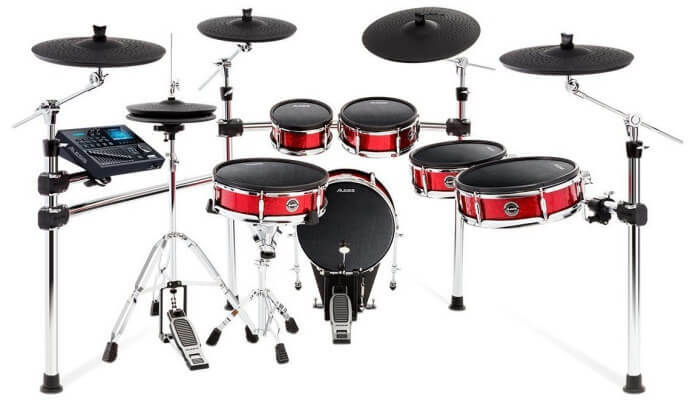 It comes with 15 built-in drum sound banks which should keep most entry level drummers entertained. The quality of the drum samples here is quite high and actually better than most on the market. The basic TD-1K comes with rubber pads but if you want a more natural feel to your snare you can purchase the TD-1KV electronic drum set which is the upgraded version and comes with a mesh snare head. The TD-1KV kit usually retails for around $100 more that the basic TD-1K electronic kit shown here but has a much better and more realistic feel to it. 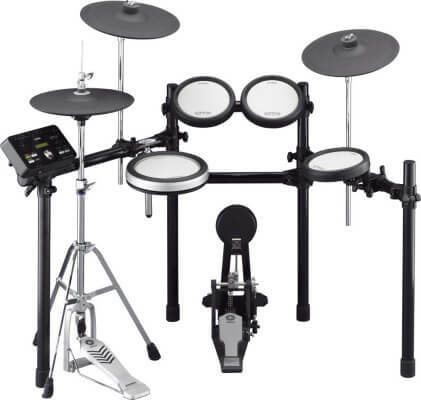 Like most beginner range electronic drum sets, this TD-1K kit comes with beater less bass pedals and floating hi-hat pedal. In this respect you get maximum positioning but lose out on the realism of proper acoustic kit hardware. A great feature of the TD-1K is its ability to take an MP3 input for play along purposes. This saves you a lot of bother and hassle should you wish to practice along with your favorite tracks. The ‘Coach Mode’ will also help out a budding drummer to improve their speed, timing and accuracy. 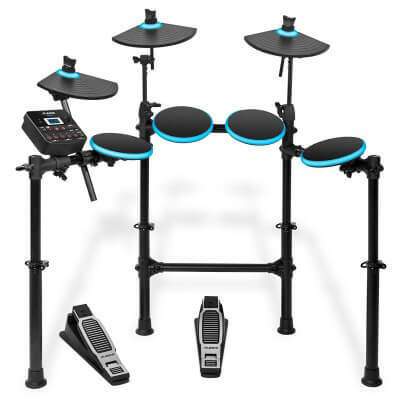 The Roland TD-1K usually retails for in or around the $500 mark and makes for an excellent entry level electronic drum set. 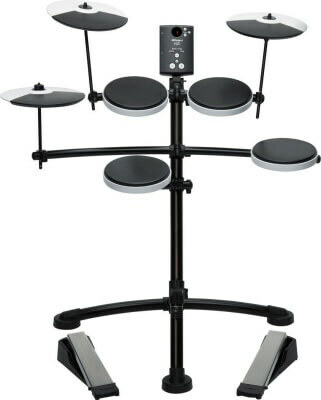 One of the top rated electronic drum kits in the beginner section is certainly the Alesis DM Lite electronic drum set. This kit is very solid and compact and even comes with 4 LED drum pads and 3 LED cymbal pads. These pads light up when you strike them for a cool dynamic feel. It’s a small enough setup to fold away which is a huge benefit to most who are new to the instrument and are struggling with space. The pads are very playable and give a strong rebound with the supplied sticks. There are 10 quality drum kit sound banks to choose from, giving you a selection of different kits ranging from rock to pop to jazz and more. The foot pedals are beater-less and are not connected to the hardware rack. They sit alone by themselves. However this makes for easy positioning but also lacks in the feeling of a real drum kit. The bass drum pedal has no beater, rather it works like the the hi-hat pedal with an internal sensor. It’s features like this, that will eventually drive the consumer to upgrade to a higher level setup, but for beginners who are getting to grips with basic coordination, they work just fine. Included in the drum brain is a ‘Learn Mode’ and a ‘Play Along’ function which is great for getting to grips with the fundamentals. Combine this kit with a professional tutor and that should be enough for anyone to form a reasonable beginner skill set on the instrument. It’s certainly one of the best portable electronic drum sets on the market and also one of the best entry level electronic drum sets. 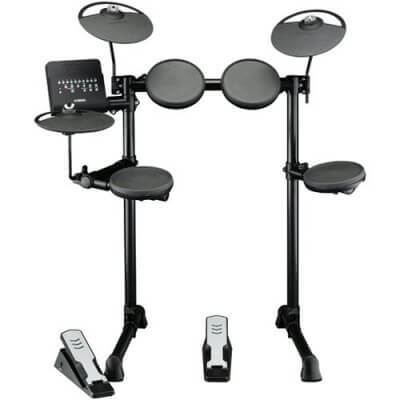 I would not hesitate to recommend this electronic drum set to any beginners looking to get started playing the drums. In the world of music, Yamaha is one of the biggest players. They produce products for practically every instrument and electronic drums are no exception. 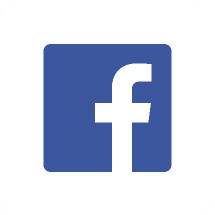 Yamaha has the reputation on the music industry that is associated with quality. The DTX400K is Yamaha’s beginner kit with value and quality being of the utmost importance. Again we have 4 drum pads and 3 hi-hat pads. These can be assigned to any one of 169 different drum sounds. That’s 10 kits in total. As with others kits in the beginner range, the DTX400K comes with beaterless pedals. This kit can easily be connected to your Mac or PC so as to record with MIDI through USB. You can get it today with Drum Throne, Vic Firth 5A Drumsticks and Stereo Headphones through the link above on Amazon. The rack is easily adjustable and does a good job of keeping every drum just where you need it. The response from the pads is quite good too, if a little hard, but that’s to be expected with a sub-$500 electronic drum set. As well as 10 different drum kits to choose from you also get warmup features and a groove exercises to sharpen your drumming skills. The DTX400K is an impressive drum kit overall but does reside on the higher end of the beginner price range. It’s a good deal more expensive than the Alesis DM Lite which offers the better bang for your buck but in terms of longevity the Yamaha kit might be the way to go. That said, the DTX400K is a great electronic drum set for beginners. 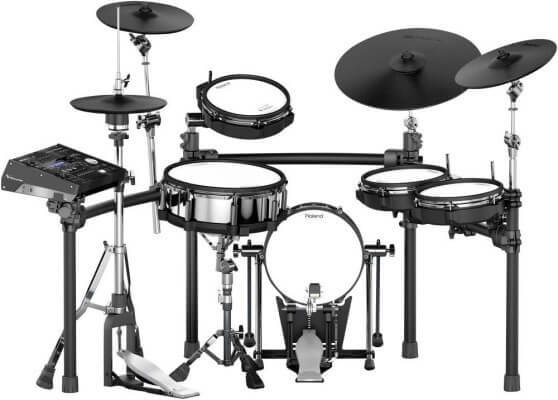 Still undecided on which entry level electronic drum set is right for you? Check out this youtube comparison video and see ff this helps you decide. Moving on from the beginner selections, we now look at affordable electronic drum kits that are aimed at drummers with some experience. As you will see, the range of features will increase and overall quality and build improves as you move up through the more expensive kits. If you’re not a total beginner and you’ve got in or around a grand to spend then you should consider some of these kits. Keep in mind that some electronic drum sets might offer features that are of no use to you, whether that be practise modes or MIDI compatibility. You can make a checklist of the features that are important to you and compare and contrast the different brands and models. Here are the top 3 contenders for the best electronic drum kit under $1000. 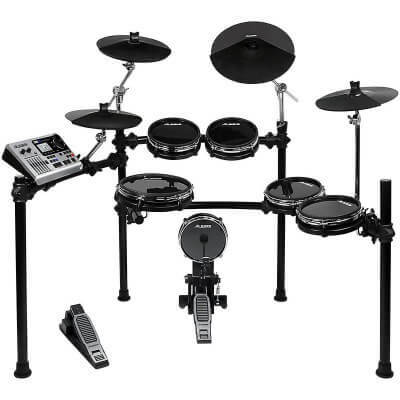 With the DM10 Alesis offer us a ten piece professional electronic drum set for well under $1000. The whole setup comprises of 4 cymbal pads (hihat, ride and 2 crash cymbals) and 6 drum pads. Each pad is mylar, although you can get mesh should you wish to fork out a bit more cash. The brain on the DM10 is impressive, with over 1000 different sound samples to choose from. It also includes 74 great sounding tunes thatvyou can play to with or without the guiding drum tracks. More importantly though, you can play along to all of your favorite songs by plugging in your smartphone, iPhone or even your mp3-player. Simply use the 2 provided auxiliary ports on the back of the module. It’s also possible to connect the DM10 to your favorite DAWs in order to expand your sample selection. The kick pedal has been upgraded to a real pad for use with a pedal which makes the overall playing experience more akin to a proper acoustic drum kit. Unfortunately it doesn’t normally ship with what Alesis considers extras, such as a drum stool, kick pedal or sticks but the build of this kit is one which you will have no problem playing in live or practice situations. For aesthetics, you have the option of choosing from an aluminum rack or a chrome rack depending on your personal preference. A step up from the DTX400K, this exceptional kit has a few extras that the previous was lacking. The main difference is the inclusion of a standalone bass drum pad for use with a pedal. Yamaha have also been kind enough to include one of their own pedals (FP6110) with the deal which will save you time and some money. The HH65 remote hi-hat is also an improvement on the DTX400K and allows for more nuanced control with several settings such as half-open, pedal and splash hi-hats. The hihat can be one of the most expressive and dynamic parts of any acoustic drum kit so any improvement here is warmly welcomed. The snare pad is a TP70S which is a 3-zone pad. This extra responsivity means it’s easier to get a more human feel to your playing. The DTX450K connects to any desktop computer allowing you to download backing tracks and playalong files. This step up won’t cost you an arm and a leg either. For a couple of hundred dollars more than the DTX400K you can get this edition. Throw in an extra $20 to get the drum throne too. Roland’s TD-11K-S retails just under $1000 and is an impressive leap on from the earlier mentioned TD-1K. First up we have the inclusion of a mesh snare drum head. This mesh head is far more responsive than the usual rubber pads and feels more real to play. This 8 piece drum set (3 cymbals, 5 drums) is one of Roland’s most popular and it’s not hard to see why. Along with the mesh snare, you also get a real standalone bass drum pad for use with the included Roland bass drum pedal, or any pedal of your choosing. The feel from the bass drum is better than most competitors in the sub-$1000 bracket and we put this down to Roland’s ‘Natural-Feel’ kick pad. It’s less springy than most kick pads and absorbs the beater in a more realistic way. The rest of the drum and cymbal pads are the standard rubber feel but with a nice kick and snare you’re halfway there to feeling like you’re playing on the real deal. The array of sounds is impressive too. Roland have always strived to offer the best when it comes to sound samples and the TD-11K-S is no exception. For those with a bit more spending power we’ll now look at some of the best intermediate or mid-range electronic drum kits available to buy for under $3000. Anything in this price bracket is considered on the higher end and professional. KAT Percussion are perhaps not as well-known as the other big players on the electronic drum kit scene but they are steadily making an impact. Previously part owned by Fender, they were recently taken over by DW. The KT4 is an eye catching drum set, most notably on first impressions for its all white look. This makes a stark contrast to the typical black pads we associate with electronic kits. Looks aside the KT4 is an impressive kit with quality abound. A 9-piece setup with 4 cymbals and 5 drum pads, the KT4 is built on an extremely robust rack for maximum solidity. The hihat stand is separate and standalone, meaning no more awkward footboard issues. It’s a 3-zone hihat too, so you can get a range of sounds from bell to edge. The snare and tom pads are 11 inch dual zone pads that can be customised for realistic drum response. You can choose from any of the 780 drum sounds and 50 kits and there’s even an effects section where you can play with EQ and reverb. You also have 44 banks in which to save any new kit configurations you create. 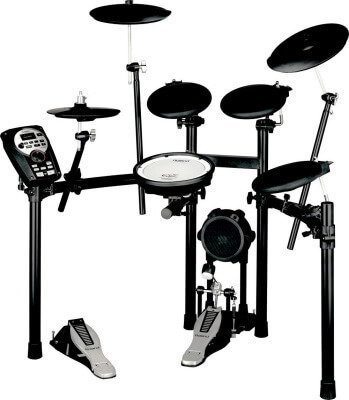 For around twice the price of the KAT KT4 you can get Roland’s TD-25V electronic drum set. 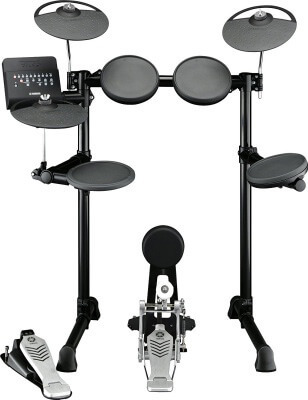 It’s one of the top electronic drum kits on offer by Roland and features many improvements on the TD-11K-S.
Each of the 4 cymbal pads is multi-zoned, meaning they respond differently to where they are struck. You can get different sounds from any cymbal by playing on the edge or closer to the center bell. There’s even a cool choke response so you can stop unwanted crash cymbals from sustaining at the end of songs or in staccato passages. Likewise the drum pads are equally as impressive. The snare has what Roland call ‘positional sensing’ which allows for nuanced playing such as ghost strokes, rim shots and even the use of tradition jazz brushes. It really is an impressive feat Roland have managed to pull off here. The hihat is more realistic than most electronic hihats yet bizarrely Roland has opted to leave out the hihat stand here, meaning that you will have to supply your own. Installation is pretty simple though, you just attach the TD-25KV hihat to your existing stand and you’re good to go. The 18 preset drum kits might sound limited but there are many more available to download when you connect to your Mac or PC. The sounds are of the highest quality and you can personalise your own kits with the multi-effects Roland have included. 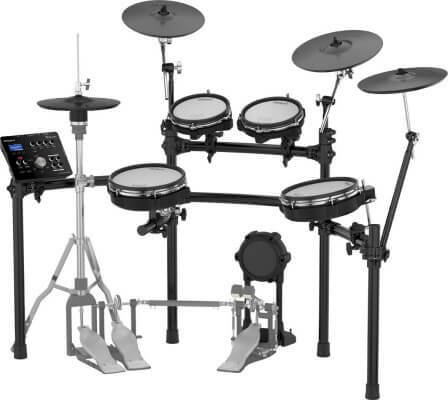 For well under the $2000 mark you can come home with Yamaha’s DTX562K electronic drum set. This kit comes with 691 high quality drum samples, 3 multi-zone cymbal pads, 4 silicone drum pads, upright hihat stand, bass drum pad and Yamaha’s RS502 drum rack. It’s an impressive package for the money and certainly is worthy of the ‘professional’ tag. One thing that is missing though is a kick drum pedal. Perhaps Yamaha felt that anyone purchasing a kit of this value would most likely have their own preferred pedal anyway so decided not to bother including one. The silicone pads are nicely responsive but not as easy to play as standard mesh heads. The array of sounds is impressive, with the ability to download more when you connect up through the USB. Playability is fairly effortless and the cymbals respond admirably to a variety of strokes. One thing about the DTX562K though is the drum pads end up feeling a tad small. The playing area of the two toms and floor tom in particular feels a bit cramped. On the other hand this could be used as a way to increase your accuracy but it feels a bit like a toy kit in this respect. Extra features on the DTX562K are a built-in metronome, groove and practise exercises. All in all a strong contender for the money. Now we come to the high end, high budget, all frills, no-expense-spared end of the electronic drum set market. Kits in this section range from around $3000 up to under $10000. You can keep spending should you wish to add a vast range of features and upgrades too. It’s worth noting that because we are dealing with digital products, there is a tendency for some of these kits to age and not keep their value. That is one of the perils of buying any digital product. The industry moves so quickly and the cost of manufacturing is constantly being lowered so that a top of the line instrument today might retail for a fraction of the price in a decade or so. The same cannot be said to the same extent with acoustic instruments. In fact, there is a school of thinking that believes that acoustic instruments actually age well and get better with time. With all that as a preface, let’s dive straight in and compare some of the best digital drum sets. With their finest electronic kit to date, Alesis have released the mightily impressive Strike Pro 6-piece electronic drum kit. Out of the box it’s an impressive looking instrument, coming in a pristine blood-red colour with sparkling chrome hardware. Alesis may call this a 6-piece but in fact you also get 5 cymbal pads, namely a hihat, ride cymbal, and three crashes. The premium multi-ply shells are available in many different sizes (8 inch, 10 inch, 12 inch and 14 inch) which really makes playing the Strike Pro an intuitive experience. You also get movable hihat for convenience and the bass drum pad is extra large, big enough to accommodate a double bass pedal. The sounds on offer are very impressive with over 1000 instruments and 200 drum kits to pick from. A standard Strike Pro should set you back less than $3500 which is considerably less than many of the competing brands at the high end of the market. You won’t find some of the fancier options included and that is a big reason for the price here. That said, the Strike Pro 6-Piece is a pleasure to play on and comes highly recommended. The TD-50KV is the older brother of the already successful Roland TD-25KV. What you get with the TD-50KV is a few extras such as larger ride cymbal, a larger snare and a new bass drum triggering option. It is currently the most expensive electronic drum kit available to buy today. The ride cymbal has been increased to 18 inches for a more realistic weight and feel. The snare on the TD-50KV is now a 14 inch diameter with an improved triple ply mesh head. This head gives a far better rebound than the previous 2-ply heads. There’s still 2-ply heads all over the kit on the toms but in this respect it works just fine having a little less rebound here. The new bass drum triggering option is a unique Roland innovation. Effectively now what you can do is substitute your real acoustic bass drum into your Roland V-Drum setup. With digital triggering it’s possible to hook up the bass drum to the TD-50KV brain and get an ultra-realistic sound response. But that’s not all. Roland have completed overhauled the sample sounds in the TD-50KV so you get an entirely new soundbank to play with. Hooking the kit up to live PA’s is a breeze with 2 XLR outputs on the back of the module. Along with the 8 analogue outputs that shipped with the TD-30 version you also get a handy USB output for recording entire sessions easily. The TD-50KV is jaw dropping in every respect, including the price. This baby will set you back anything up to $9000 in some cases. If money happens to be no object, you can do no better than this incredible piece of drum technology. As the latest addition to Yamaha’s DTX700 series, this electronic drum kit is truly one of the best around. It ships with four snare and tom pads, all 3-zone and on Yamaha’s brand new RS700 rack system. Sound-wise you’ll have over 1300 drum and cymbal samples to choose from including some of Yamaha’s own prestigious range of acoustic kits. There’s also a whole host of additional percussion and FX sounds should you be in the need for something a bit unorthodox. On top of the vast built-in soundbanks, Yamaha have made it easy to import your own samples so you can recreate existing kits or create new hybrid collections. Like all top end electronic drum sets, the DTX760K is fully compatible with all major DAWs through USB. On the feet, we have a larger than normal bass drum pad for maximum realism with also a solid and secure standalone hihat stand. The feel is that of a real kit from the hips down. There’s a noticeable difference in how the toms and snare are tuned that gives that proper acoustic kit feel. The snare is slightly tighter than the toms and that is how it usually is on a real kit. It helps that the snare is not attached to the rack and rather it has its own snare stand on which to sit. The KB-100 bass drum pad is big enough to fit a double bass pedal and gives a satisfying ‘thud’ response. Finally with the hihat you’ll experience some ultra-real sample selections and subtle pedal responses. With the DTX760K you’re getting the best that Yamaha has to offer and it shows. 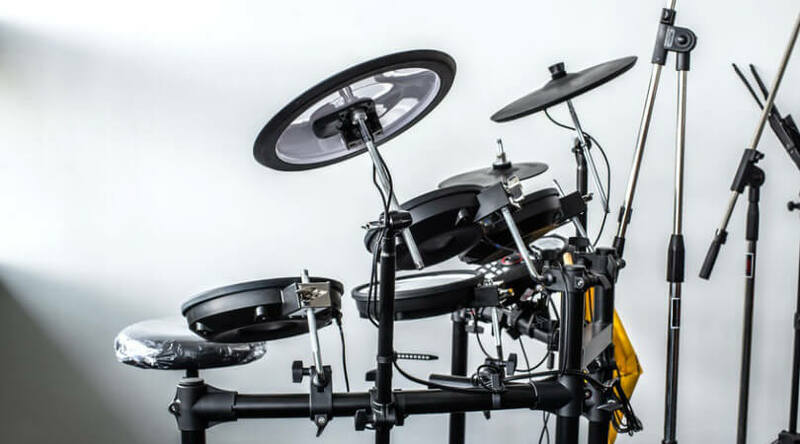 We have looked at some of the best and best value electronic drum sets on offer today and weighed them up against each other. In most cases there are arguments for different brands and it usually comes down to the money you are prepared to spend. In the case of the beginner who is completely new to drumming and wants a good electronic kit to learn the art on, it seems like there is one winner here. The Alesis DM Lite offers real value and quality technology for your dollar. The sounds will keep any newby entertained for months and it’s built to take a moderate pounding. If you’re new to drums and want the best band for your buck, go with the DM Lite. Moving onto the next price category we again compared three brands which are Alesis, Yamaha and Roland. The Roland TD-11K came out the more expensive of the three but it is also head and shoulders above the other two. It feels better to play and this is down to Roland’s attempts to maximise comfort with the mesh snare head and natural feel bass drum pad. Along with comfort, the Roland sound samples are just a bit better that either the Alesis or the Yamaha’s and that tipped the scales in its favour. For mid-range purchasers there is perhaps more to choose from with a better selection across the board. All three are competitive and have lots to offer but the value represented by the KAT KT4 was and is hard to beat. From the 780 instrument selection to the dual-zone drum pads, the KT4 delivers value that is undeniable. You could go out and spend over twice on a Yamaha of Roland but it would be hard to justify the difference. For mid-range buyers it’s all about getting the best product at the best price and the KT4 wins this at a canter. As a 9-piece kit, with 4 cymbals and 5 drum pads, you probably won’t need to look at upgrading it either. The high-end comparison threw up some impressive kits but which can be called the best electronic drum set today? Well, clearly if money is no object to you then go out and buy yourself a TD-50KV. The playing response on this kit is incredible and the updated sample set is stunning in itself. When it comes to value though, it’s hard to look past the Alesis Strike Pro 6-Piece electronic drum kit. It’s less than half the price of the Roland and is a beauty to play on. The different sized drums make for a very enjoyable playing experience and the kit feels more expensive than its price tag suggests. Whatever your requirements you should keep in mind everything in this review when making your purchase. Do you need mesh heads? Do you need 3-zone cymbals and the ability to choke a crash? It would always be good advice to actually seek out the electronic drum kit you have in mind and to get a trial run on it. It’s only when you are physically behind the drum set that you will know whether it feels right for you and your playing style. Will you be using it to practice or will you be playing live gigs with it? Do you need to hook up your laptop or desktop for recording purposes? You can save a bit of time and money by getting your priorities straight and knowing beforehand what matters to you with an electronic drum set. Make sure to shop around for the absolute best price you can get. Many stores, both online and on the high street, will offer to match the best price you can find, so use this to secure a good deal for yourself. If you are also interested in acoustic drum sets, please check out my article on finding the best acoustic drum kit here.